Liz Birt – Tomato Town organically grows heirloom tomatoes in the greater Kansas City area as well as Johnson County, Leawood, Lenexa, Olathe, Shawnee, Merriam KS, Independence MO and Kansas City Missouri, KCMO. Varieties include: Cherokee Purple, Brandywine, Stupice, Carbon, Black Krim, Black Cherry, Yellow Pear, Absinthe and Aunt Ruby’s German Green. 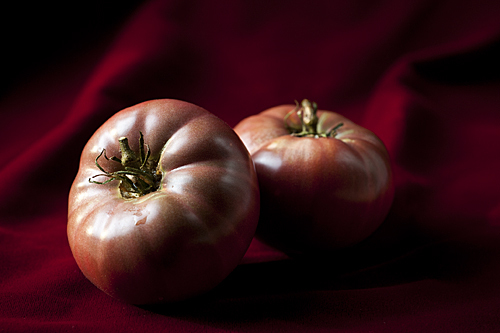 Created by local tomato breeder Keith Mueller, this tomato is a pinkish-black beefsteak with green shoulders and a silvery sheen. Keith breeds his tomatoes for flavor and Liz Birt is an interesting mix of smoky and sweet. If you close your eyes, you can taste the attributes of the two tomatoes that were crossed in its creation: Cherokee Purple and Brandywine. This entry was posted on Monday, August 8th, 2011 at 2:34 am. It is filed under TomatoTown Favorites, Varieties. You can follow any responses to this entry through the RSS 2.0 feed.